Every time Florida missed a field goal or botched a special teams play last year (and having been present at the Tennessee, LSU, Georgia and Vanderbilt games, I saw far too many) I repeatedly longed for of our dear old friend Caleb Sturgis. The drop off from “Mr. Automatic” Sturgis in 2012 to 2013′s committee was precipitous – the team made only one field goal attempt from outside 40+ yards. Boy did the Gators fall hard. To give you an idea of last season’s futility, the Gators scored 30 points fewer than their opponents on field goals. In total, they were 12-for-21 in the kicking game (8-for-8 from 20-29 yards out; 3-for-6 from 30-39 yards out; 1-for-7 from 40-49 yards out; and 0-for-1 from 50+ yards out). By the mid-point of the year, going for three wasn’t an option. Coming off a season where a total of three games were lost by six points or less (Georgia, South Carolina and Georgia Southern), improving the kicking game will be paramount to the team’s success. Three kickers, Austin Hardin, Frankie Velez and walk-on redshirt freshman phenom Danny Krysalka return in 2014. While all indications at the spring game pointed towards an improved performance (3-for-4 on field goal attempts), fans still have reason to worry about this position in the fall. Head coach Will Muschamp said during one spring scrimmage that Hardin was 7-for-9 (missing from 47 and 41) and Velez was 7-for-8 (missing from 46). 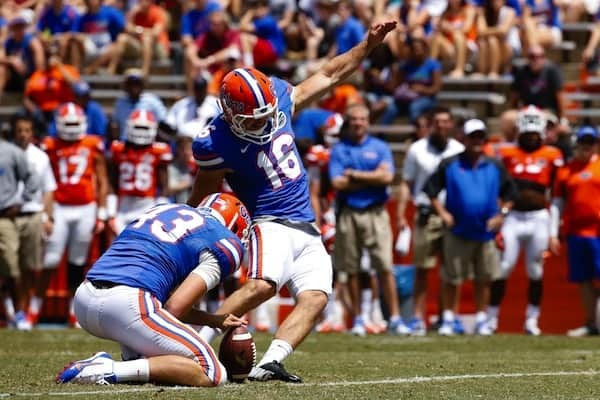 While duplicating Sturgis’ efforts from two years ago might be asking too much, expecting 41-yard field goals from kickers at the University of Florida is not. Whether he needs to visit the soccer program and get kickers with longer legs, or coach these players a little more closely, Muschamp must find answers for a glaring lack of accuracy and talent. Points must be easier to come by than in 2013. As for the punting game, it has, by all indications, drastically improved. Kyle Christy appears to have returned to form (with a 52.5 yard average in the spring game), and moved beyond last season’s disappointment. As the 2012 season proved, field position is crucial to Florida’s gameplan. Pinning opponents deep in their own territory and letting the vaunted Gator defense do its job works – it worked to the tune of an 11 win season not too long ago. In looking at kickoff returns, getting Andre Debose, the best returner in school history, back should provide a shot in the arm. Florida averaged less than 20 yards per return last season, which, again, doesn’t win games in the SEC. Overall, while the (lack of) offense was the dominant story in 2013 – and will continue to be so heading into 2014 – a major underlying concern for this team is special teams. They must improve this upcoming season. While certainly not the “sexiest” issue to talk about, leaving easily attained points on the board is even uglier.